It’s a rack. It’s a tube. It’s a Wine Tube! 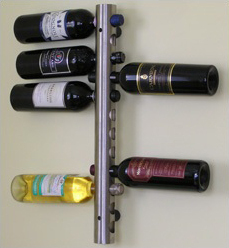 The Wine Tube is designed to elegantly house and display your precious wine bottles. It’s unique design will certainly get your guests talking since, when mounted, the Wine Tube give the illusion that it is actually floating away from the wall! Made from hearty stainless steel, the Wine Tube houses up to 12 wine bottles which can easily be turned to display their labels prominently without being blocked by rack wood or wire. Its contemporary design is sleek and classy and, for music lovers, the Wine Tube has been said to resemble a flute. The Wine Tube is affordably-priced, too, making it a perfect gift (or guilt-free impulse buy!) It fits almost all wine bottles, and the diameter of each mounting hole is 30.5mm (1.2 inches). The Wine Tube is two feet long, with a 2” diameter, but you’ll want to measure to be sure you have enough space to insert wines from either side before mounting. Several Wine Tubes can be placed around a room if you desire to separately organize reds and whites, and you can get creative mixing and matching bottles on either side of a tube to create the perfect “balance” for your room. The Wine Tube makes a great conversation piece for apartment dwellers with limited wine storage space who also want to display their wines with sophistication. 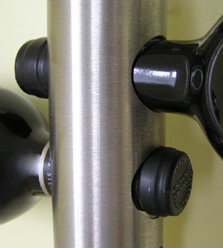 Designed for years of use, the Wine Tube is a creative, new addition to the tried-and-true systems of storing wine.